The Beaver Mountain Residence looks out to the south down the Yampa Valley. This private, luxury residence exudes contemporary elegance and is crafted with meticulous attention to detail. The slope side, private residences at One Steamboat Place are located at the Gondola and offer ultimate ski-in, ski-out access. 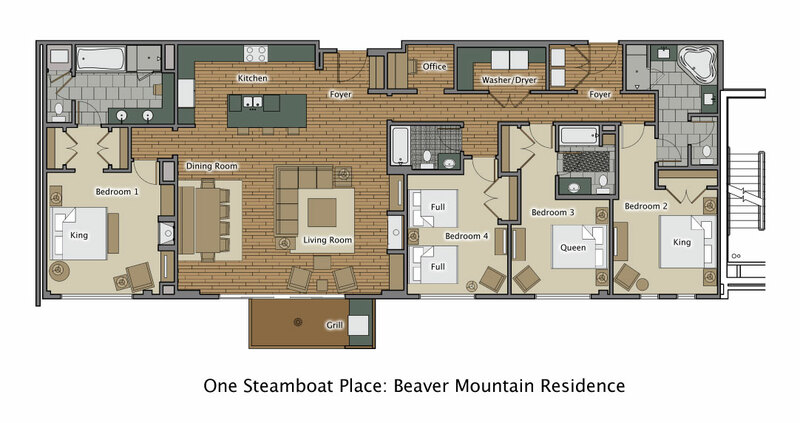 The Beaver Mountain Residence features a large living area with valley view and its open floor plan connects the living and dining areas to the kitchen with plenty of room for the entire group to gather. All One Steamboat Place residences feature luxurious furnishings and décor throughout the home. Each master bedroom offers a gas fireplace and the master bath features a steam shower and Jacuzzi tub. We had a great family vacation! There were 6 adults and one infant! We had a blast. The unit was comfortable, but it needed some light bulbs! The TV acted strange-sound got muffled-so we had to turn it off and then back on about once an hour. The kitchen was well stocked with items needed for cooking. We did a fair amount of cooking since we had a six moth old. WE had stayed at One Steamboat Place in 2015 and were very impressed by the wine and tapas in the afternoon. This year, not so much. This was an amazing vacation, plain and simple. We brought 8 adults and 9 children (under age 10) so we were apprehensive about staying in one condo, but our stay could not have been better. Not only was the location perfect for Steamboat -- right at the base of the mountain -- the condo itself was super nice and spacious and the customer service was impeccable. I am a raving fan and would recommend One Steamboat to anyone. A long overdue review of what was an exceptional stay at One Steamboat Place. We stayed there during the busy Christmas week, with extended family in a 3 bedroom apartment. This is much more than a holiday rental. This is effectively a hotel with 24/7 service, any technical issues were dealt with within minutes, food delivery from nearby restaurants was seamless. Best off all is the ski valet service slope side and the apes ski drinks reception in the lounge. Just picture , skiing down after a full day, your skis are taken from you by a valet, your boots stored, you walk 5 mins into the lounge to a good selection of wines, beer, soft drinks, snacks all inclusive. The next morning, you walk 5 mins out of your apartment the valet has your skis, all cleaned and you're off once again. It could not get better. We stayed at OSP with the whole family. The four bedroom condo was perfect! Clean, modern and comfortable. The staff is outstanding and goes above and beyond. The location is amazing, I can only imagine how great it would be to stay there in winter with such easy slope access. the service is 5 star...everybody was sooo friendly and helpful. what great customer service!!! the condos are exactly as pictured, clean and modern, only the very best of everything from sheets and towels to the appliances in the kitchen to the bar-b-que grill on the deck. first class all the way!!! we never took our cars out of valet, as they took us anywhere we wanted to go and they picked us up as soon as we called to bring us home. there was 7 of us, and still it was never a problem to get us where we wanted to go and back. very impressive!!! i wouldnt stay anywhere else in steamboat now..they spoiled us for any other condo or hotel. you MUST arrange a trip here, it is such a beautiful city and this place is such a joy to rest and relax in.